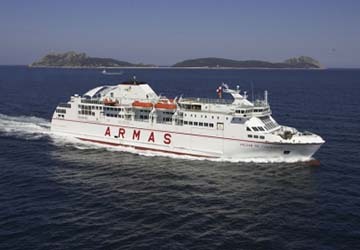 The vessel was first put into service in June 2006, adding to the already impressive fleet held by Naviera Armas. Capable of carrying up to 1500 passengers, the facilities on board lend themselves to a leisurely journey from Tenerife to La Gomera. Many halls and lounges adorned in comfy armchairs cover many of the communal areas, the perfect place to sit back and relax as the ship weaves across the sea. In some areas there are a few sofas comprising the seating areas, and also an outdoor seating area for crossings in the summer. A cafeteria is open throughout the entirety of the crossing, should you feel the need to grab a quick snack before you reach the harbour. For set meal times, a self service system is available, providing a wide range of dishes to satisfy your hunger. As well as the self service buffet, there's a restaurant open at set times serving delicious fresh food. The quintessential items are available in the duty free store; cigarettes, cologne and wholesale food items can be bought for very cheap prices. A children's play area is on board the boat to keep your children entertained for an hour or two. For facilities catered towards adults, there is WiFi available so you can finish off some work or catch up with some friends. As well as the play area, children's highchairs are situated in the eating areas so your child can eat in comfort. Elevators can transport passengers from the car garages to the upper decks, as well as travelling between floors. Please Note: Whilst we have taken great care in making our Volcan de Taburiente guide as accurate as possible, onboard facilities, services and entertainment may vary depending on the date and time of year that you travel, facilities mentioned may change without notification and ferry companies reserve the right to operate vessels other than those mentioned at time of booking without prior notification.